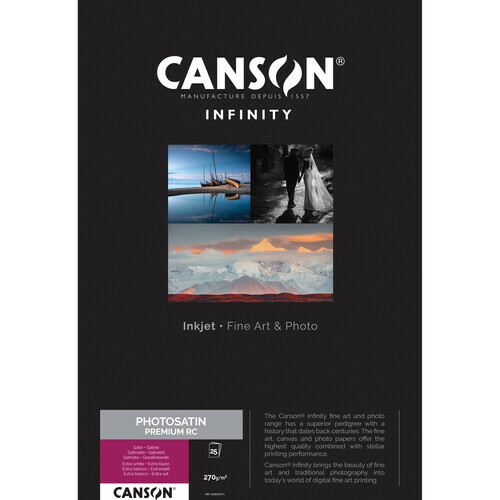 Made from a 100% alpha cellulose base and featuring a structured polyethylene coating and microporous color receiver layer, PhotoSatin Premium RC Paper from Canson Infinity will provide photographers with a surface that softens reflections and has a wide color gamut. The 270 gsm paper is available here as a 25-pack of 11 x 17" sheets and features a thickness of 10.3 mil. Along with this, it uses a moderate amount of OBA content to hit a whiteness of 137.18%. For longevity it is acid free and internally buffered while it is also instant drying and highly water resistant for easy handling. Box Dimensions (LxWxH) 17.7 x 11.85 x 0.85"
PhotoSatin Premium RC Paper (11 x 17", 25 Sheets) is rated 4.0 out of 5 by 5. Rated 5 out of 5 by src from followup of past reveiw I contacted Canson on the quality issues. They were very good in working with me. they replaced the defective paper. I am not sure how to rate this paper but based on the current lot, I love it (I really liked it in the past, I just didn't like the inconsistent quality). The bottom line, if you don't have quality issues, this paper is great. If you do, contact Canson and they will work with you. Rated 4 out of 5 by Jay from Not Really a Satin Finish This paper is more akin to a semi-glossy instead of a true satin finish. It also needs a bump up in saturation to get the true color. Nevertheless, the paper is one of my faves. I have always preferred semi-glossy to luster. Rated 1 out of 5 by src from inconsistent quality I like the satin surface but the quality of the coating process is very poor. About half the sheets have flaws which are not obvious before printing but very obvious after the image is laid down. Rated 5 out of 5 by Anonymous from really solid photopaper really this is an excellent product, produces beautiful photos. Just make sure you use the profile for this paper. Rated 5 out of 5 by doug from Seriously the best bang for buck Love this. Yes you can do better with Hahnemuhle, but for this price range this is the best you can do.